Viva Venezuela! Defend the fight for socialism! As opposition violence claims ten lives in Venezuela, the social media machine has gone into over-drive, borrowing images from all over the globe to paint the Bolivarian revolution as repressive and dictatorial. On 22 February Supporters of the Revolutionary Communist Group rallied at Grey's Monument in Newcastle upon Tyne, challenging the international media propaganda that is being used to attack the fight for socialism unfolding in Venezuela. The opposition represent the interests of the elite who are desperate to reverse the concrete gains of the working class under the Bolivarian Revolution that has slashed levels of extreme poverty, provided free health care and education for all, built hundreds of thousands of houses, developed thousands of social projects and is building a real transformative democracy of the working class through socialist communal councils and comunas. They are desperate to preserve their luxurious lifestyles and share of private profits in the economy. Throughout the years the opposition have shown they will stop at nothing in their attempts to topple the Bolivarian government, from coups and assassinations of their own supporters to economic sabotage and calls for direct US military intervention. In direct contrast to our solidarity with the Bolivarian Revolution, the representatives of this privileged elite also mobilised on the streets of on 22 February. A group of around 15 international students from Latin America, clad in designer clothes and sunglasses, gathered to demand and 'end to violence and scarcity'. These so-called champions of peace and stability had nothing to say about the opposition's role in promoting this violence and scarcity, refusing to acknowledge the use of false images and media manipulation exposed in our placards. Our rally easily thwarted the opposition students mobilisation as we made the connection between the fight for socialism in Venezuela, with the fight against austerity here in Britain that is seeing families faced with eviction and homelessness at the hands of the vicious bedroom tax . The fact is Venezuela, alongside socialist Cuba, is spearheading a movement for socialism across Latin America, challenging imperialism and neo-liberal exploitation, demanding dignity and human development. The Bolivarian Revolution remains a beacon of hope and inspiration for movements across the globe. The Venezuelan opposition demands 'democracy', however since 1998 Venezuela has held four national referendums, four presidential elections, and eleven parliamentary, regional, and municipal elections. Throughout this process the Carter centre, which has observed 92 elections across all continents, has described Venezuela's electoral system as 'the best in the world'. The opposition's problem with Venezuela's democracy is that they have been repeatedly defeated at the ballot box, most recently in December's municipal elections where Chavista forces won 76% of positions. The opposition 'demands freedom of speech', yet the BBC reported in 2012 that only 4.58 percent of television and radio channels belonged to the Venezuelan state, whilst 80% of the media is private. According to the AGB Nielsen Media research company, three main opposition national newspapers (El Universal, El Nacional and Ultimos Noticias) attract 90% of the readership. Of the four television channels with national coverage, three of them (Venevision, Globovision, and Televen) are opposition, and attract 90% of the audience. The opposition demands an 'end' to scarcity and inflation which has soared to over 50%. Whilst the economy is undoubtedly in difficultly, the roots of this can be traced to hoarding and speculation, tools of an 'economic war' that the private sector is waging against the Bolivarian government. One company that has been repeatedly exposed as hoarding food and other scarce items is the Polar Monopoly, which controls nearly 50% of food production and distribution networks. Whilst the food scarcity index has lingered around 20%, during the nine months to June 2013, across the last two presidential elections, more than 40,000 tonnes of hoarded food has been uncovered in private warehouses and stores. The Polar monopoly is owned by the 'Mendoza Group' business conglomerate, which is owned by Lorenzo Mendoza, the 329th richest man in the world. Damningly, Leopoldo Lopez, who has been leading the recent opposition mobilisations with his Voluntad Popular political party, is a member of the Mendoza family, whose conglomerate has been engaged in the hoarding and speculation linked to high levels of food scarcity. On 22 February, President Nicolas Maduro also denounced the recent burning of various Mercal and Pdval trucks that were transporting food, reporting that opposition groups additionally torched a Bicentenario market in Bolivar state. As Mercal, Pdval and Bicentenario are state subsidised food programs, these acts illustrate the depth to which the oppositions concerns for food scarcity run. The opposition demands an end to violence and repression, however they mention nothing of the repeated acts of violence perpetrated by the opposition in recent years, not least April 2013 when fascist thugs burnt down healthcare centres, ransacked schools and destroyed transport systems following electoral defeat at the ballot box. Both Leopoldo Lopez and Maria Corina Machado, leaders of 'the exit' strategy are well versed in violent destabilisation and played key roles in the failed 48 hour 2002 coup against Hugo Chavez. The current protests have claimed at least 10 lives, a fact that is being used to justify calls for sanctions and foreign intervention to force the resignation of Nicolas Maduro. However the circumstances surrounding these deaths needs to be exposed. 'Of the ten deaths recorded in connection with the violence so far, five occurred in the Caracas area. Three of these deaths resulted from violent clashes on 12 February between opposition activists, security forces and in a few cases, Chavistas. A Venezuelan intelligence service officer has been arrested in connection with one of the deaths. Authorities report that investigations into the events are “almost complete” and the results will be presented to the country soon. On Tuesday Genesis Carmona, a student and former beauty queen, was shot during an opposition march in Valencia. According to national newspaper Ultimas Noticias, witnesses said an armed pro-government group attacked the march. However authorities say ballistic investigations show the woman was shot from behind “from within opposition ranks”, and claim that witnesses on the scene have confirmed this. Five of the deaths occurred on the barricades that hard-line opposition supporters have erected in several Venezuelan cities to block the flow of traffic and pressure President Nicolas Maduro’s resignation. On Tuesday a 17 year old student was run over by a car while trying to block a road as part of protests. The man accused of running him over has been arrested. Meanwhile on Wednesday a public attorney, Julio Eduardo González, died when he crashed his car trying to drive around a barricade in Valencia. Yesterday a woman, Delia Elena Lobo, died after crashing her motorbike into a barbed wire street barricade in Mérida. The ninth to die is Arturo Alexis Martinez, the brother of a socialist party parliamentary deputy, Francisco Martínez. He was shot dead in Barquisimeto while trying to clear away the burning remains of an opposition road barricade. An investigation has been launched into the incident. A tenth person was confirmed dead this evening. Elvis Rafael Durán died in the Sucre municipality of Caracas after riding his motorbike into an unseen barbed wire barricade. Venezuelan press initially reported a another death following a shooting attack against a pro-government “march for peace” in Bolivar state on Wednesday, in which industrial workers from the region participated. However it later resulted that the worker in question had not died, but was seriously wounded. Nine were wounded in the incident, and sixteen have been arrested. A video taken of the shooting appears to show hooded figures firing at the march from a nearby building. 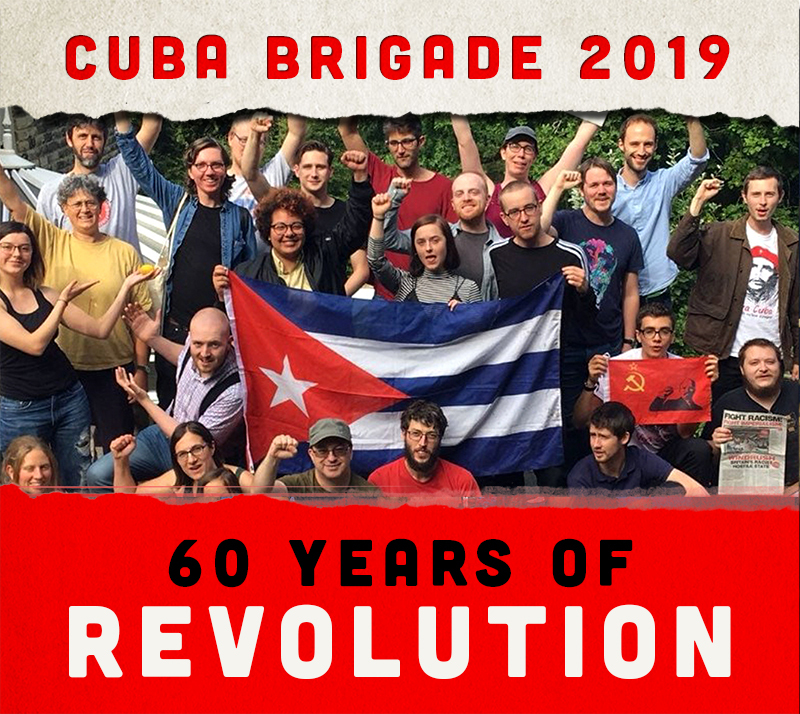 As we set out in our documentary and pamphlet 'Viva Venezuela – Fighting for socialism' , we live in a world dominated by crisis, imperialist war and exploitation. We are told there is 'no alternative' to cuts, privatisation, hunger and homelessness. The Bolivarian Revolution illustrates what can be achieved when governments and people, working together, put human need before capitalist profits. Despite Chavez's death in March 2013, the process is being built every day by millions of Venezuelans, working to create a society built on collective, socialist organisation and production. In that conscious struggle the spirit of Hugo Chavez lives on. As the capitalist crisis bites in Britain, Venezuela provides an inspiring example of how the fight against austerity can develop into a fight for socialism. This is why it is important to defend the Bolivarian Revolution on the streets of Britain, Venezuela illustrates that not only is another world possible, but this world is being built today in Latin America!.